It was another successful year as parents, coaches, players and speakers gathered for a weekend of discussions on college tennis and junior tennis. I was happy to participate and speak to parents and players, along with Bill Tym, Master professional and former college coach; P.A. Nilhagen, Nationally recognized junior developer; Bobby Bayliss, Notre Dame Men’s Head Coach; Paul Torricelli, Scholarship for athletes; Michelle Dasso, Illinois Women’s Tennis; Suzi Sullivan, Corporate Fitness Director-Club-net Corporation. The highlight for me was talking junior tennis with the man who was a junior tennis star when I started this job, Joey Blake. I knew that Joey, who now runs Top Notch Tennis, had a host of junior accomplishments (like a U.S. Open Junior Doubles title), but I found out this weekend that he also had a perfect 7-0 record against Andre Agassi! He fascinated the elite players who participated in the training camp. Among those players was Dennis Nevolo, who just committed to the University of Illinois for fall of 2008. The entire weekend was orchestrated by CARE Academy Director Mark Bey, above, who put the Conference together for the eleventh successful year. 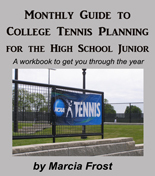 It is a must for anyone involved in junior tennis, especially those thinking about playing college tennis, so mark your calendars for next November in the suburbs of Chicago.